On a bare hill in Arlington National Cemetery, Gen. John J. Pershing's grave is marked by a modest headstone with a sparse summary of his life--name, title, home state, and dates of birth and death. There are no stars, no quotes, and no hints of his greatness or his role in growing the Army from a 125,000-Soldier force to a 2 million--Soldier force for World War I. Instead, his ethos can be seen in the grass near him. His last desire was to be buried next to the doughboys he commanded in Europe, whose names are not legends but whose actions brought victory. Last year, as we commemorated the 100th anniversary of America's entry into that war, I wrote an Army Sustainment column asking, "What would Gen. Pershing think of Army readiness?" Since then, the Army has made tremendous strides in improving not only readiness today but also readiness for 2028, when technology will surely bring fast-moving threats on land, in the air, at sea, in space, and in cyberspace. We established the Army Futures Command to modernize the Army, including the equipment we supply and how we get it to the warfighter. We are refining how we manage talent, making sure we are involved in career decisions and always in the context of how talent management makes units better. We are improving materiel readiness and increasing the lethality of combat units. We also upgraded our ability to project the force for rapid deployment by rebuilding our basic skills and institutional muscle memory. All are topics we have discussed in the pages of Army Sustainment during the past year. This month, as we commemorate the 100th anniversary of the end of World War I, Pershing's genius for organizing is still the standard to be studied. How did he do it? He insisted that the Army should have everything in place before committing troops to battle. He understood the importance of logistics. He learned lessons from every experience and put them to good use. "Military genius is really only the capacity to understand and apply simple principles founded on experience and sound reasoning," Pershing said. I hope this 100th anniversary gets us all thinking about how we can best organize our structure for the future as successfully as Pershing did in 1918. In a special interview in this edition of Army Sustainment, former Chairman of the Joint Chiefs of Staff, retired Gen. Martin Dempsey, leads us in that discussion. He talks about how, in today environment of ubiquitous information and fragile facts, leaders achieve trust by being radically inclusive. People need to contribute and bring meaning and not feel like they are being dragged around. In another interview, Gen. Stephen Townsend, the commander of the Training and Doctrine Command, says that every Soldier in the Army is a role model for somebody, and so we all need to be the kind of leader we want to be led by. Indeed, I first learned about building a team as an ROTC cadet at the University of Arkansas at Pine Bluff. My fellow cadets and I were going to Army advanced camp, and they wanted all of us to be RECONDO [reconnaissance and commando] qualified, which meant we had to go through leadership, physical fitness, land navigation, and swimming competitions. Coming from a small school, we really wanted to show that we were just as competitive as cadets attending much larger schools with more resources. The problem was that five of us could not swim, including me. The faculty taught us how to swim, but they did not teach me well; I almost drowned twice. But they motivated me enough that I wanted to be successful in representing my school. Even though it was challenging, we earned our RECONDO badges. More importantly, those instructors passed to me a lesson on the importance of motivating teammates in order to be successful in the profession of arms. In the Army, you are never alone. When two or more Soldiers are together, one is in charge. Our power as an Army is in our shared experiences and how we support one another to bring about a ready Army. From my experience, four things stand out as essential to organizing successful units. First, quickly make new members feel at home. When new Soldiers show up to an Army unit, there is an instant baseline understanding of who they are based on the ranks they wear. It is automatically assumed they have the skills and abilities commensurate with the experience level represented by their grades. 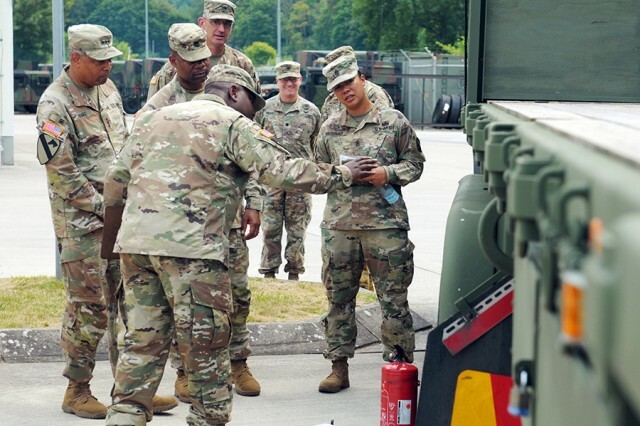 It is the job of leaders to fully integrate them into the new unit with meaningful responsibilities, and the new Soldiers need to take on the tough jobs and do them well. Second, share experiences and grow the unit. The ties that bind military members together are born of unique experiences and hardships shared by no other profession. Take advantage of the Army's lessons learned systems; after all, we can all learn from others' mistakes so we do not repeat them. Be honest when you mentor and always counsel your subordinates; they deserve nothing less. Tell your Soldiers what they need to know, not what you think they want to hear. As a mentor, Gen. Pershing passed great insights to the next generation of generals--Gen. George Marshall, Gen. George Patton, and Gen. Douglas MacArthur--and set conditions for success in what turned out to be World War II. Sharing can be fun, too. Take your Soldiers on staff rides, hold team-building events, use ceremonies to strengthen your units, socialize outside of work, and build family support networks because families are a critical part of the team too. Third, always do what is right, even when no one is looking. A leader's credibility is the most valuable asset to a unit. Nothing happens without leadership focus. You rub off. You are a guide and a role model. At all times, live the Army values and exemplify the profession of arms. Model what right looks like and others will follow. As Pershing said, "A competent leader can get efficient service from poor troops, while on the contrary an incapable leader can demoralize the best of troops." Fourth, remember the golden rule. Treat your teammates with dignity and respect, the way you want to be treated. Personified on that hill in Arlington National Cemetery by Gen. Pershing and the Soldiers he led are those characteristics that make for great teammates: courage, sacrifice, devotion to duty, and humble professionalism. On the slopes of that sacred cemetery, they are joined by thousands of other battle buddies from America's wars. That includes Gen. Pershing's two grandsons, 2nd Lt. Richard Pershing, who was killed in Vietnam, and Col. John Warren Pershing III. We are grateful for every Soldier's sacrifice in every war and for their reminder of our obligations to organize, modernize, train, and equip Soldiers for the next mission.